This offseason has been infamously slow, and the Brewers have made only minor adjustments to their big league roster thus far. A flurry of moves are undoubtedly still to come, as Yu Darvish, Jake Arrieta, and J.D. Martinez still remain unsigned. But with spring training about five weeks away, the chance that the Brewers have their Opening Day roster already mostly settled increases by the day. In 2017, Jonathan Villar performed so badly that the club had to bring in Neil Walker to play second base while they pushed for the playoffs. Although they fell short and missed the wild card game, Walker performed admirably. In 38 games with Milwaukee, Walker posted a .305 True Average (TAv) and was worth 0.9 Wins Above Replacement Player (WARP). One win from Walker in a quarter of the season is a good output, as it represented an upgrade over Villar’s season-long .242 TAv and 0.8 WARP. As we are all aware, though, the Brewers have not yet re-signed Walker. The only infield transactions they’ve made have been re-signing Eric Sogard and adding Mauricio Dubon to the 40-man roster. Both Sogard and Dubon profile as more utility types than everyday second basemen, though, so their presence should not preclude an actual upgrade. Both are capable of playing the position, but neither is good enough that the Brewers—a team with playoff aspirations—should be satisfied. Walker is the most obvious solution. He is not a superstar, but he is a solid player, and he may be available on a shorter, one- or two-year deal because the free agent market has collapsed. From 2013 through 2016, Walker had been worth between 2.9 and 3.5 WARP. That is a valuable player, and that level of consistency would be useful for a team that will be relying on some high-variability players (Lewis Brinson, Orlando Arcia) for their playoff push in 2018. Even during last season, which was a down year by Walker’s standards, was not actually that bad, as his cumulative 1.7 WARP still made him worthy of a roster spot. But as I mentioned above, the offseason is coming to a close, and the Brewers are running out of time. This doesn’t matter so much if Walker is the solution, because the free agent market as a whole is moving slowly. But if Walker signs elsewhere, the late date in the calendar makes working on a contingency plan more difficult. Free agents are likely to sign quickly once the dominoes start falling simply because of the lack of time left in the winter, and the second base free agent market is not that deep. There just aren’t that many exciting options; Danny Espinosa is the only one who appears slightly intriguing. This late stature in the offseason also matters because it decreases the amount of time for a potential trade. I don’t know what the Brewers front office is working on, and I imagine they are working on upgrades at basically every position. But they cannot be pursuing every angle at once, so if Walker is the first choice, then pivoting to finding trade partners will still take some time. Spring training is quite long, so one could argue that there is no need to make a move in the next month anyway. A spring training trade, or even an April trade, would bring in a player early enough that the Brewers’ overall season would not be impacted. The front office does not stop working once spring training starts or Opening Day arrives, so whether reinforcements arrive on January 30 or March 30 may not matter all that much. The timing of these moves do matter, though, because the Brewers are at a bit of a crossroads in terms of how willing they are to push for the playoffs this year. If they are waiting until March or April to address this kind of need, then they are unlikely to also be investing resources in a starting pitcher. Thus, while the timing of when exactly a new second baseman arrives is mostly irrelevant, it would be indicative of the club’s broader strategy. This article works on the assumption that an upgrade is needed, and I think the club believes that as well. David Stearns has proven himself too smart to think that Eric Sogard is a long-term option; despite his 1.257 OPS in May, he finished the year with an OPS of just .770. Even this was over one hundred points higher than his career mark of .638. Mauricio Dubon is unproven, and questions remain about his bat. The Brewers seem to love Hernan Perez, but he has a career .244 TAv, and he backslid from his seeming improvement in 2016. That leaves Villar, who had a disappointing year and appears to have lost the club’s trust. Even though he ended the season well (.888 OPS following the Walker trade), he could not regain his playing time, as he got only 63 plate appearances in the last 42 games of the season. Villar was given a long rope, as no move was made to replace him until mid-August, but the rope did look as if it ran out. Craig Counsell’s use of Villar in August and September suggests to me that the club does not view him as a solution at second base. If that is the case, then an external option must be in the cards. 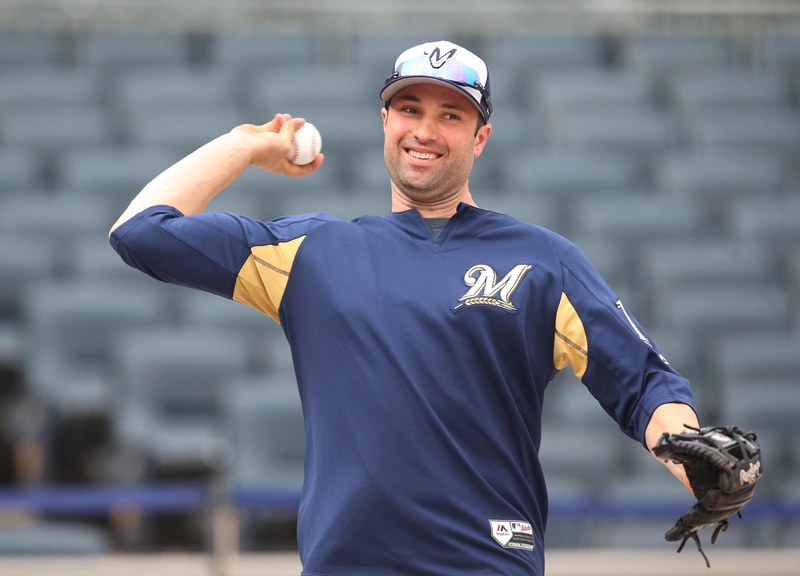 Because of the glacial pace of the free agent market, though, if Neil Walker is not that player, the Brewers are running out of time to find a backup.